Appearing at the city-owned Shenkman Arts Center, located within a squeaky-clean shopping district in the Ottawa community of Orleans, Cowboy Junkies brought in hordes of sharply-dressed concertgoers for a Thursday night performance. Rescheduled from a cancelled February date, the Toronto alternative country mainstays were able to properly promote their latest album; the July-released All That Reckoning. 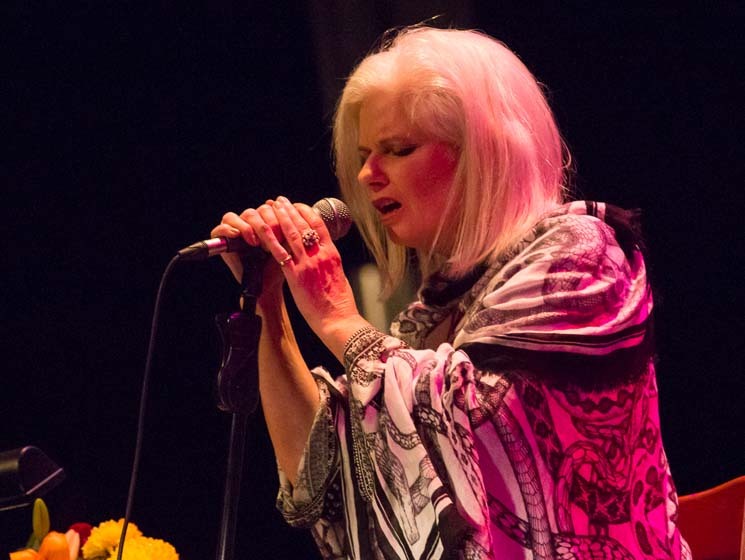 Without an opening act, Cowboy Junkies started their set at 8 p.m. sharp, bringing along longtime multi-instrumentalist Jeff Bird, who joined the Timmins siblings seated among the modest-stage setup. Opening with a haunted version of "All That Reckoning (Part 1)," Margo addressed the crowd, letting them know that they'll be playing two sets; a first set designed to "sell records," which consisted of only tracks from their latest LP, and a second set filled with their hits. Running through eight of the album's 12 tracks, the band seemed stiff and stifled until vocalist Margo Timmins leapt to her feet to grip the mic stand during their first set closer, a more upbeat reprise of their opener, titled "All That Reckoning (Part 2)." After a 20-minute break to allow concertgoers to, according to Margo, "drink and go shopping for our albums at the merch booth," the five musicians returned to the stage to perform a cover of Lightnin' Hopkins' "Shining Moon," from their 1986 debut Whites Off Earth Now! !, along with album tracks, "Just Want to See" and "Lay it Down" from 1996's Lay It Down and "Escape is So Simple" from 1990's Caution Horses (a far cry from the hits they promised in the show's second half), which found Bird stealing the show with his impassioned harmonica solos and gorgeous electric mandolin leads. Speaking to an audience member who was celebrating his 74th birthday, Margo joked that her band don't have a happy song in their repertoire to dedicate to him, opting for a stripped-down acoustic version of Vic Chesnutt's "Supernatural" (from their 2011 Chestnutt covers album The Nomad Series Volume Two: Demons) that found bassist Alan Anton and drummer Peter Timmins briefly leaving the stage. Omitting singles from their set like "A Common Disaster," "Anniversary Song," and "Sun Comes Up, It's Tuesday Morning," the band ended the audience's bewilderment by closing the two-hour show with a pair of their most recognizable tracks, Lay it Down's "Misguided Angel" and a deconstructed, beautifully moody version of the Velvet Underground's "Sweet Jane," from their 1989 masterwork, The Trinity Session. Returning to the stage for encore versions of David Bowie's "Five Years" and Patsy Cline's "Walkin' After Midnight", Cowboy Junkies left the polite, comfy and seated crowd with a set that had them feeling challenged and a bit uncomfortable.